​This week has been filled with sickness in my home. My three year old daughter underwent surgery to get her tonsils removed. As I watched her come out of surgery and endure pain, it took everything I had to not weep with her. I knew all I could do was hold her and pray for her comfort. My focus was all on her; nothing else mattered. As I prayed for her, I heard God say, “ This is the same love I feel for you. The love you feel as a mother to Abi”. It is a privilege to be the one my children reach their hands out to for a comforting touch; to be the one who rubs their backs when they aren’t feeling well. There is no one who can comfort quite like a mother. I believe God feels the same. I see God like a parent, saddened and worried over our constant state of unwellness. Surely God jumps at the chance to help us if we ask. How God must rejoice when we actually ask for something that might help make us well, or make others well. You may ask, “Where was God when I was struggling and needed comfort from HIm?” The answer: He was there with you the whole time. He may have showed you His comfort and love through someone else like a friend, neighbor, teacher, another relative, who knows? But I promise you that God was loving you through the pain and the void. “Can a mother forget the baby at her breast and have no compassion on the child she has borne? Though she may forget, I will not forget you! See, I have engraved you on the palms of my hands…” (Isaiah 49:15-16). God never forgets you. He always sees you. He knows and cares about what you are going through. Are you are driven? Do you strive for perfection in all that you do? I do. If you are like me in this area, you also probably never feel good enough, never perform at the level you want, or get as much done on that daily list. You have also most likely stepped on and over people you love in the process of achieving those goals and have missed the very people that are most important in your life. You beat yourself down and are your own worst enemy. Let’s look at it now from this perspective. What if God was so busy he missed us? Do you ever think some of the people in our lives might just want “us” and not care about our track record of success? Don’t we want the Lord’s eyes on us? At the end of the day we serve a merciful God who knows how desperate we are for Him. He sees and knows the cry of our heart. We are under the protection of a mighty God. A God that offers us a secret place with Him when we are broken; a place we can run to at the end of our day or in the midst of the crisis. Yet, the reality is we don’t have to wait for those moments. We can live in that secret place of the most high God and abide under the protection of his wing in all that we do. 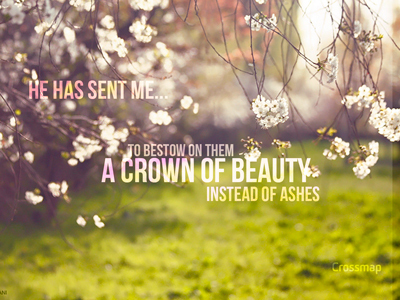 The Bible tells us he will give us beauty for ashes. I am so thankful for that. Who else can do that but our God? Will you receive that for yourself today? Did you know in Biblical times, when people were mourning or really struggling,, they would actually lay in ashes? Think about that for just a second. You have a problem in your life, so you go sit in a pile of ashes. A dead place with no beauty. How often do we do that, not literally, but just sit in our ugly mess of pity, anxiety, stress, anger, depression. But our God says he can take whatever we are going through, no matter how difficult, hopeless or horrible it may be and give us beauty. He will pick us up out of those ashes of life where we have beaten ourselves down and make something beautiful out of us. He creates each of these moments as opportunities to show us his grace. Scripture says he will take our difficult, disgusting, depressing and horrible situation and give us beauty. He will pick us up out of the ash pile of life and make something beautiful out of us. Did you know the Hebrew word for ashes is epher and the Hebrew word for beauty is pher? All you have to do is move the “e” and you have a new word. It is that easy for God to transform us as well. Will you believe that today? Ecclesiastes 3:11a He has made everything beautiful in its time.